This #meatlessmonday, we’re also focusing on #mealprepmonday! Because even with the holiday weekend coming up, we’ve got packed schedules and no time to worry about making lunch every day. (Plus going out for lunch, even to pick up a sandwich, can get expensive!) Luckily, the warm weather means there’s plenty of healthy options available for salads on the go. We’re going through a few grain-and-greens salad recipes this week that can be easily transported via jars! 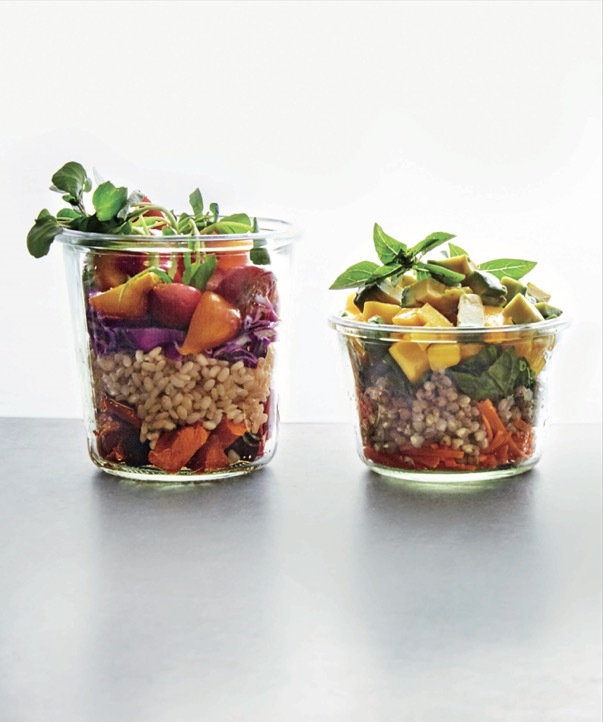 Cooked whole grains and grain-shaped pasta make a universally appealing base for a quartet of grab-and-go salads for two. 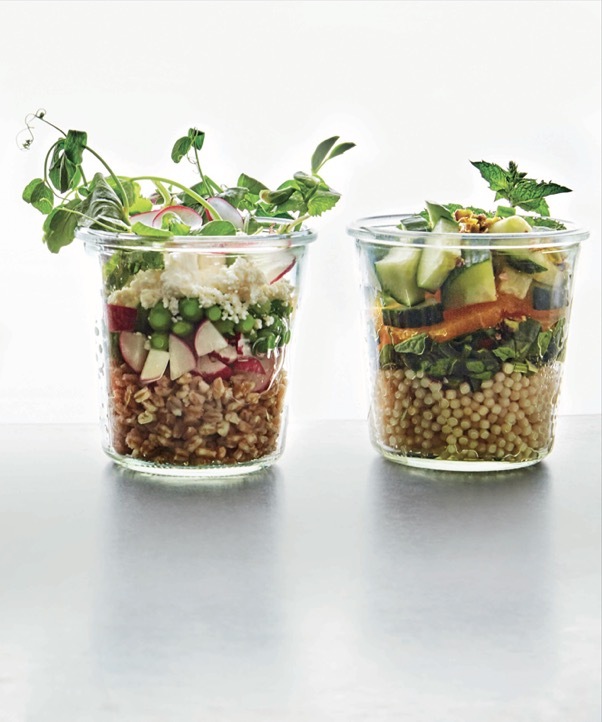 Layer the grains in pint-size jars with the best fresh vegetables, fruits, and herbs you can find, then cover and go—whether to work or a picnic. Add the vinaigrette just before serving. In a bowl, toss the warm orzo with the vinaigrette. Let cool. Divide the bell pepper equally between 2 jars. Top with the orzo. Layer the red cabbage and beets on top and garnish with watercress sprigs. In a bowl, toss the warm wheat berries with the vinaigrette. Let cool. Divide the carrot equally between 2 jars. Top with the wheat berries and torn basil. Layer the mango and avocado on top and garnish with basil sprigs. In a bowl, toss the warm barley with the vinaigrette. Let cool. Divide the mixture equally between 2 jars. Layer the radishes and peas over the barley and top with the cheese. Garnish with pea shoots. In a bowl, toss the warm couscous with the vinaigrette and cumin. Let cool. Divide the mixture equally between 2 jars. Sprinkle green onion and mint over the couscous. Layer the orange slices and cucumber and top with a sprinkling of toasted walnuts. Garnish each salad with a mint sprig. In a jar, combine the vinegar, shallot, mustard, olive oil, and salt and pepper to taste. Cover and shake until well blended. For more delicious recipes to make with a friend or loved one, check out Newlywed Cookbook on Amazon!